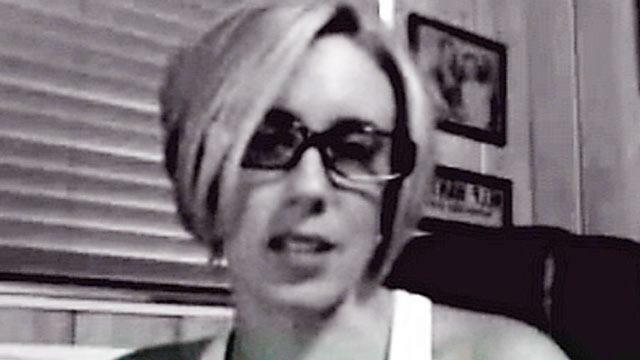 A restyled Casey Anthony has made a public debut, speaking publicly for the first time since being released from jail , addressing her video diary about adopting a dog, paying for her own computer and the optimism she feels about her future. "The good thing is things are starting to look up and things are starting to change in a good way. Let's just hope they stay, that things stay good and that they only get better," she says before adding with a whisper, "They'll only get better." ABC News confirmed from a source close to Anthony that the video was genuine. In the Oct. 13 video, Anthony, 25, sports a bleached blonde bob that is dramatically different from the long, dark hair she often wore in a ponytail during her sensational murder trial which ended in her acquittal. She also wears dark-rimmed glasses and a white tank top and sits in what appears to be a leather office chair in a wood-paneled den or office with photos on the wall. "There really hasn't been that much going on except now for this and, you know, I'm extremely excited," Anthony says. "I'm extremely excited that I'll be able to Skype and obviously keep a video log, take some pictures and then I have something that I can finally call mine." Anthony was acquitted last July of murder in the death of her daughter, Caylee, but was convicted on four counts of lying to law enforcement for claiming that 2-year-old Caylee had been stolen by a babysitter. She is currently serving one year of probation in Florida for a check fraud conviction. After being released from jail, Anthony went into hiding amid death threats from people who were shocked that she was not convicted of killing her daughter. In the video, Anthony alternates between seeming relaxed and happy with being pensive and serious. She expresses excitement with her new video blog. "This has just been such a blessing in so many ways and now I, in some ways, have someone to talk to when I'm by myself so I'm not bothering the poor dog who I've adopted and I love and he's as much my dog as any of the other pets I've ever had," she says. Anthony does not mention her daughter or her parents during the video blog. She is estranged from her parents who made it clear that she cannot come home after Anthony's lawyer accused her father of molesting her as a child and helping to dispose of Caylee's body. During the video, Anthony makes several comments about just starting to figure out the new gadgets in her life—a computer, camera and phone. "I'm just starting to figure out my new computer and, I don't know, I guess I'm liking it so far. It's obviously a different ball game for me because I've never used this before," she says. "I've actually now paid for my own computer. The camera was a gift, but these are things that are mine…that I don't have to give back. It's kind of me finally being able to say that I have some belongings that are mine that I'll be able to take with me after I leave here next year." Anthony must stay in Florida as she serves out her year-long probation and checks in monthly with a probation officer. There is a possibility that she could get off probation early, but she says in the video, "It's going to be a while [before] I leave." After speaking on and off for just over four minutes, Anthony signs off, but not before suggesting that there will be more to come from her. "So, this is the end of my first video log. I'll probably do another one later…maybe I'll bring the dog, who knows?" Anthony says. "But this is again the first of many and I'm looking forward to this. It's going to be scary because I hate being on camera, but, I don't know, I need to conquer that fear at some point…this is a good start. So, here's hoping. It's the end of the first, just the beginning."